If you would like to ask me any questions directly and live, or be one step ahead of the meta check out my stream at http://www.twitch.tv/sigmasrb at 5 PM CEST almost every day and follow the feeds on Facebook - https://www.facebook.com/sigmasrb or Twitter -https://twitter.com/sigmasrb for all news! I will try to stream at this time in between 3-5 days a week where I will be playing all of my decks posted here plus some other ones. You guys made this deck really sizzle! Hey guys Sigma here, 8-time Legend player, Deck Architect, Guide Writer and Hearthpwn Analyst coming to you with one more deck and this time it's a control warlock based around Reno Jackson. As a lot of you have been asking me to post my Reno deck, which I came up with the release of the first wing of League of Explorers, this deck takes the best from a Demonhand deck, and combines it with good, sticky minions both from the arsenal of the Warlock and the Neutral minions. League of Explorers has a new explorer on board! The deck gameplay revolves itself around the usage of high value minions, whilst having some of the best AoE spells in the game. It all starts with the early board control with minions like Zombie Chow, Dark Peddler and Imp Gang Boss to help you get through the rough early game while entering strong mid game with Twilight Drake, Piloted Shredder, Voidcaller and, if matched-up against a very aggresive deck, Refreshment Vendor, whilst if facing a deck that relies on flooding the board (secret paladin, zoo deck, spells like Hellfire, Shadowflame and Demonwrath come into play. Besides the strong late game with monsters like Sylvanas Windrunner, Dr. Boom, Mal'Ganis and Molten Giant, there are the combo minions that can be spawned out of the Voidcaller, there is Lord Jaraxxus which is very useful against a lot of match-ups, e.g. Priest, and if you are feeling low on HP at any point, cheap (or free) Molten Giant, followed by main star Reno Jackson himself, can mean in most cases the ultimate demise for your opponent. Mulligan for this deck varies quite a lot, and it doesn’t cut it to just write it out for Aggro and Control so we will base the Mulligan for the DemonReno on classes. Please note that this is dedicated to the meta in Season 21 and 22 and it is open to change at some point, so it might not be as accurate in 4 or 5 seasons unless updated. On the other hand, it won’t be divided into “With Coin” and “Without Coin” simply because this is a control deck, but if I have to say, I would keep 4 mana drops with coin ALWAYS. I will start with the most popular classes and finish with the ones least present in the current meta. A little sidenote - I usually keep 4 drops with the coin, but you can keep two of them if you have two other cards besides that that are 1, 2 or 3 mana. If you don't get anything you can even consider ditching the 4 drop too, just to get some early game minions! Regarding Priest matchups, Lord Jaraxxus is mostly a game winner, so if you feel lucky and have a couple of good early cards besides Jara, keep him. Please note that the evaluation that I give is solely based on my experience and some others close to me. I will be noting what kind of a match-up it is with the percentage being the rate of your expected victory them being: Very bad – 20%-30%, Bad 30%-40%, Average – 40%-60%, Good 60%-80%, Very Good 80%-100%. Patron – Good Matchup - 65% – With the Patron Warrior, as long as you manage to establish the game until turn 5 you should be good to go. Save that Hellfire and Shadowflame for when he drops patrons, save BGH for Grommash Hellscream/Dr. Boom, save the Darkbomb for Patrons/Korkons/Shredders. Big taunts are a big problem for patron warriors, so if you get some big taunts out with the help of the Voidcallers and the demons that might come after they die, you should be good to go. Make sure you are careful with your HP because one tap might decide the game as it goes into mid or late. 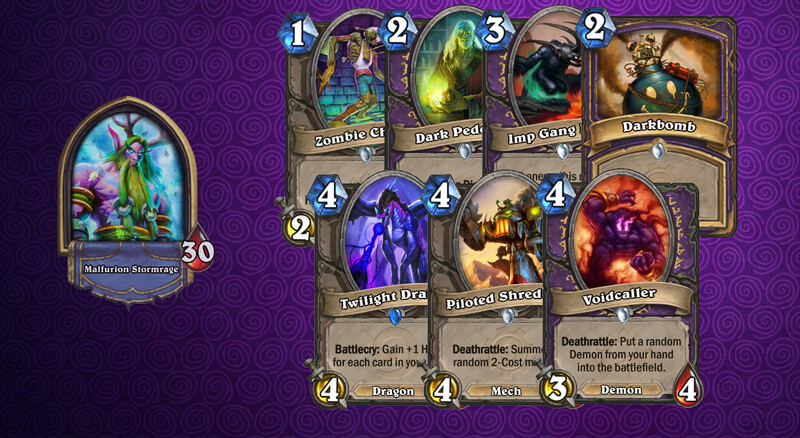 Key cards: Hellfire, Twisting Nether, Twilight Drake. Control (Normal or Dragon) – Good Matchup – 60% - The control warrior can be beaten easily as long as you are aware of his Executes. Try to make him use his Execute on your Twilight Drake, because they are of the most utter importance for the Ctrl Warr in this match-up. Just keep the control of the board, tempo him down as this deck is more or less tempo based as much as control and try to keep his armor low to try and evade those annoying Shield Slams. Key cards: Twilight Drake, Doomguard, Voidcaller. 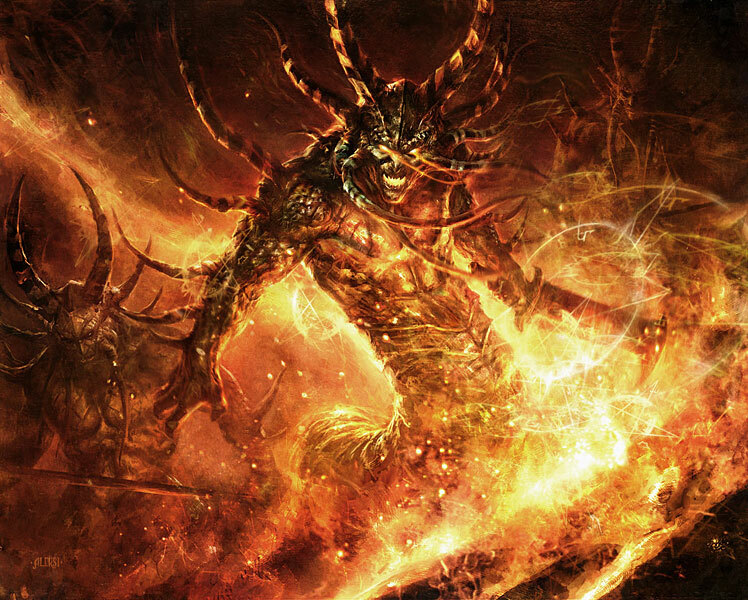 Midrange Zoo/Zoo – Good Matchup – 70% - Tempo-ing a midrange zoo while having the threat with Shadowflame and Hellfire at all times is a big problem for a midrange zoo. See if you can save the Ironbeak Owl for the Voidcaller or the Nerubian Egg, drop the taunts when you can and you should have a very easy game. Get Jaraxxus out at some point and he will insta-concede, I guarantee you this. Key cards: Hellfire, Voidcaller, Lord Jaraxxus. 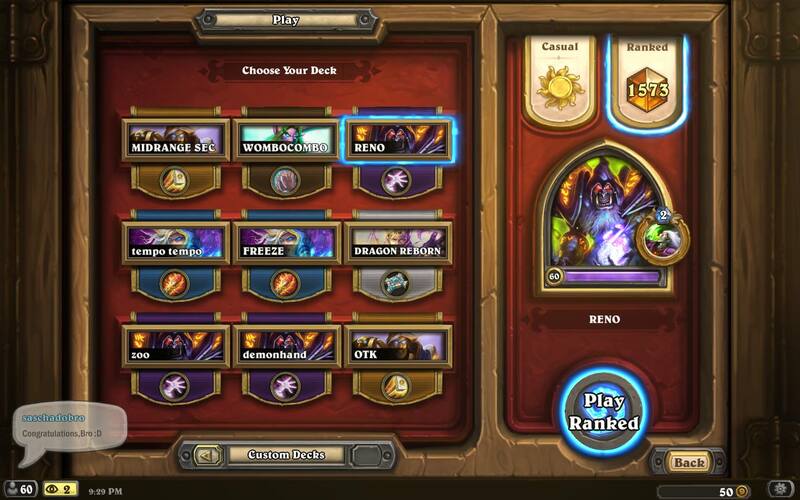 Renolock – Average Matchup – 50% - Here it all depends on how good your or his midgame is. If he drops a Twilight Drake which is facing your Voidcaller, then you are in the green, especially if you have a strong demon in your hand like a Doomguard. Later it all comes down to how much will you be able to remove from his board with a Molten Giant + Shadowflame combo, if you get a good combo then you should have an easy game with them. Tap away when facing a handlock, get as many cards and options as you can. Save Acidic Ooze for when he plays Lord Jaraxxus. 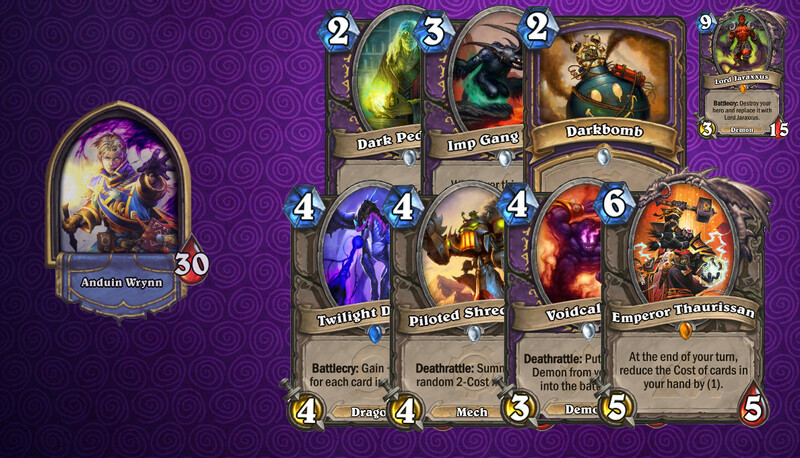 Key cards: Twilight Drake, Molten Giant, Shadowflame, Lord Jaraxxus. Secret – Average Matchup – 55% - Even though I played a lot of games and won most of them, I have to put this at 55% as it all just comes down to how paladin draws. If he gets a good 4,5,6 curve, you can be in a big problem, if not, it’s usually an easy game. It can be tricky in the beginning to make a good mixture of getting minions out on the board while removing his but practise makes perfect. I have found the Imp Gang Boss to be a star of this match-up as it gives you an opportunity to trade multiple times. Try to save Imp-losion for turn 5, to throw it before his Mysterious Challenger, so that you can trade a 1/1 into the Noble Sacrifice. Try to save the Ooze until it helps you make the swing, best used on Ashbringer, but Truesilver Champion is also fine. Key cards: Imp Gang Boss, Acidic Swamp Ooze, Hellfire. Face (Ebola) – Average Matchup – 40% - The face paladin might present a problem for this deck as the only cure against them is getting a Zombie Chow out or a Sunfury Protector and then try to trade them in while using your Darkbombs on the Shielded Minibots. 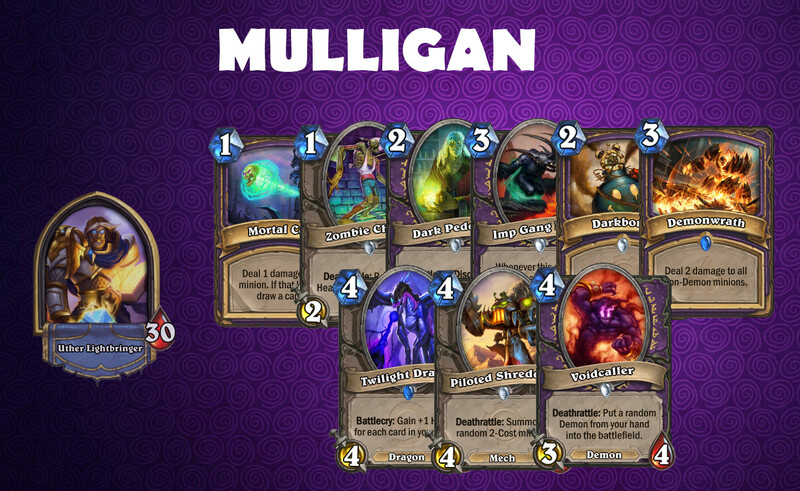 Mulligan aggressively for a Mortal Coil as they run a lot of 1 HP minions. The match-up is worse than all of the other aggro decks because of the immense number of Divine Shields, which warlock is terrible against. 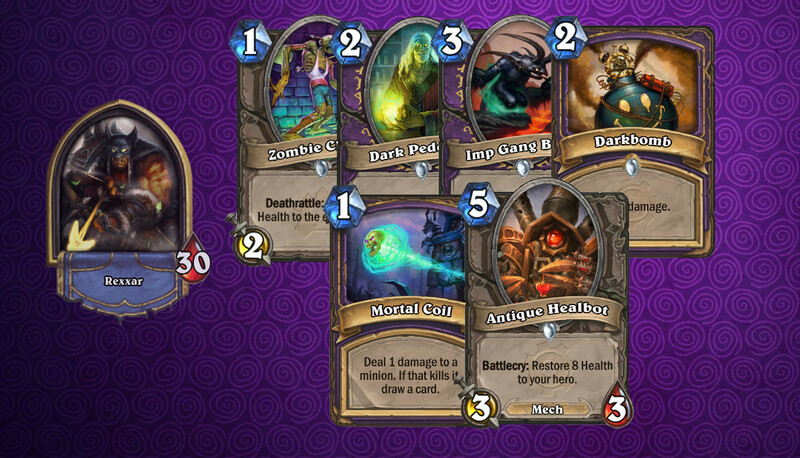 Key cards: Mortal Coil, Zombie Chows, Hellfire. There aren’t really any hunters anymore so I will leave this blank – open to future editing when meta changes. Oil – Bad Matchup 30% - If you don’t manage to get out some decent taunts and to recover after they hit you for like 8 damage or something like that you will lose for sure. A very hard matchup for this deck, but not unwinnable for sure. Remove their minions, remove the Azure Drake especially. They might seem benevolent, and that’s because a lot of people forget about that Spell Damage +1. Also, minions are supposed to be removed or else you will get wrecked by Tinker’s Sharpsword Oil. 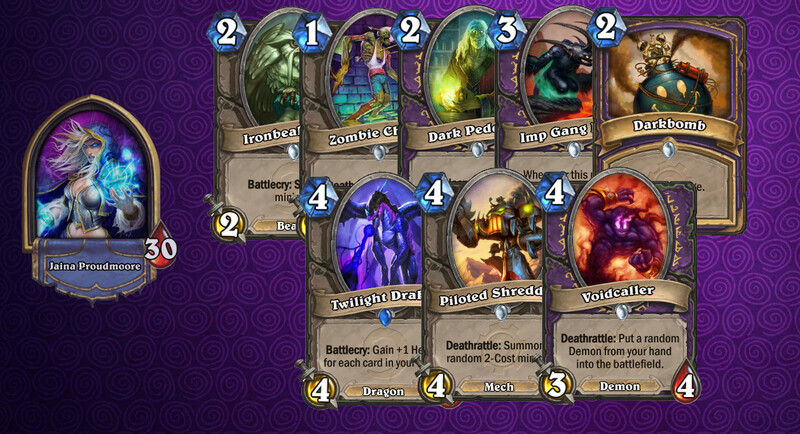 Key Cards: Twilight Drake, Acidic Swamp Ooze, Dr. Boom, Antique Healbot. Aggro – Very Good Matchup – 80% - The shamans are relying solely on board overwhelming and then ravaging you with their spells and Doomhammers. The removals as for every aggro deck are key here and will get you to an easy victory. Dropping a Molten Giant followed by a Reno Jackson is usually gg for them. Here you can save the owl for their Tunnel Troggs, and of course save the Acidic Swamp Ooze for their Doomhammer, which also shuts them down pretty well. 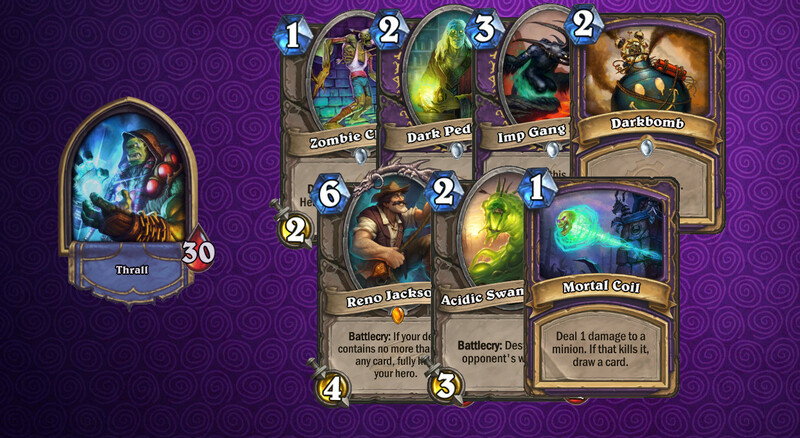 Key Cards: Key cards: Hellfire, Mortal Coil, Reno Jackson. Control – Very Good Matchup – 85% - Priests have a limited amount of big target removals, two Shadow Word: Deaths, one or maybe even two Lightbombs and maybe a BGH. Fill out their board with taking the Lightbomb into consideration and from the moment you drop Lord Jaraxxus on the board, they will usually concede as they will have run out of cards that can deal with your infernals that you are spawning every turn. Key Cards: Voidcaller, Lord Jaraxxus, Molten Giant. Midrange/Ramp – Bad Matchup – 30% - The problem here is them getting out strong minions before you manage to get good board presence, but if you manage to get out strong turn 4s then you should be good to go. Reno Jackson will probably always feel like an overkill and you will have to even drop him sometimes just for the board presence, but definitely do whatever you can to maintain board control. Don’t forget to count how much damage they have with the combo and remove minions if they do have enough damage. Key Cards: Twilight Drake, Voidcaller, Piloted Shredder. Flamewaker – Bad-Average Matchup – 40% - With Tempo mages, just as with any other, you need to find a way to cut their tempo off, either with your early minions or some removals like Hellfire or Darkbomb. If you manage to have at least 1 minion on the board at all times and they manage to burn you down just in time for you to drop your Reno Jackson, they practically have no chance. The Early game minions like Zombie Chow are the perfect example of a minion that can cut off Tempo mage’s tempo. Key Cards: Zombie Chow, Hellfire, Darkbomb. Freeze/Echo – Very Good Matchup – 85% - Very simple matchup. He uses Alexstrasza, you use Antique Healbot/Reno Jackson. You run him down. There isn’t a way he can get your HP down unless he manages to get a lot of fireballs from Archmage Antonidas whilst still controlling all of your board. That is usually a very hard assignment for a Freeze Mage. Dr. Boom is also a very good card against freeze mages, because the bombs can make them die on their turn, as the Ice Block [/card]doesn’t trigger then. Of course don’t forget to save the Owl for the [card]Doomsayer. If the deck reaches 50 upvotes, I will write out one of the SigGuides for it, which will probably be even more detailed than ever! The only reason that I am setting up this goal is to motivate you guys motivate me motivate you (motivating x ∞) and to know that you guys like the deck enough for me to write out details for the gameplay! Until the goal has been reached, I will leave you guys with this new mulligan and I will be adding a card replacement section if I find time in the next day or two. Wow guys, over 100 upvotes in a day! YOU GUYS ARE AWESOME! As a thank you, I started working on the guide early and have it already done for you to enjoy! Read on further for more details! As I don’t want to make the guide way too long, I will try to be compact, but rich in content in the guide. So the strategy will be one big part that will cover all of the aspects. I would love you guys to give me feedback if you prefer the earlier guides where I gave 3 side strategy tips and put it all into spoilers or this format. Even though Mulligan depends a lot on whom you face, this deck in the early game shines with the use of cheap removals like Mortal Coil, Darkbomb and Demonwrath and the use of good, reliable minions like Zombie Chow, Dark Peddler and Imp Gang Boss. All of these minions, except the Peddler have really good trading stats and can help you to wholly overwhelm your opponent’s board. The early game is where you will almost always have space for 1 Life Tap, and of course the amount of your Life Taps per game depend on what you are facing. If you are facing an Aggro shaman, I usually don’t tap more than once, unless my hand is really bad, while against Priest, I see to use my cards and to tap almost on every turn, taking the overdraw into consideration of course. If you are facing Mage, Druid, and Priest, you can throw out the Ooze, but save them for every other class. 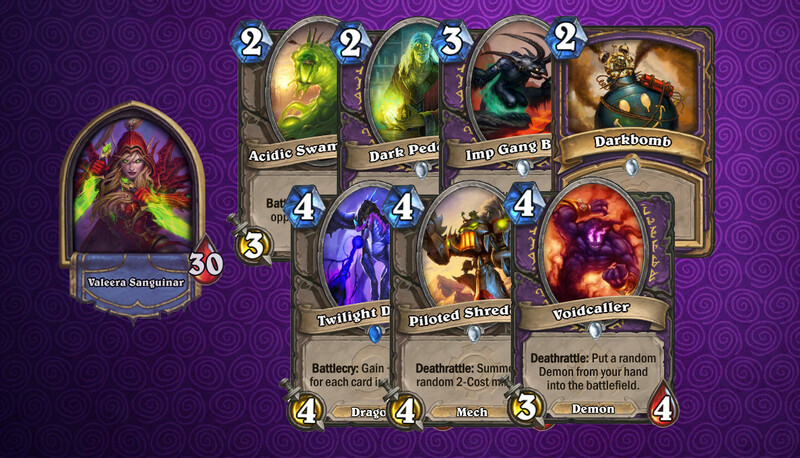 If you can see that a Warlock is using cards like Haunted Creeper, Nerubian Egg, Flame Imp, then throw it out. Save it otherwise as you can destroy the weapon of Lord Jaraxxus, which is really painful for the warlock. In the beginning, I usually try to get minions out of the Dark Peddler, just to help you secure the board, like Flame Imp, while if I am facing aggro I try to find that Mortal Coil or even pick Leper Gnome, to have more trading options. More about Dark Peddler in the late game part below. The mid game is where this deck truly shines. There are more than enough turn 4 and 5 plays, with Twilight Drake, Piloted Shredder, Voidcaller and even Refreshment Vendor being good board bodies. Imp-losion will help you in many situations as it helps you trade up AND gives you a number of 1/1 minions to help you control the board well. Turn 3 Coin+Twilight Drake is still a killer play and probably always will be. This is the time where you can stop the tempo or aggro decks like the Defender of Argus, or remove your opponent’s board if it starts overflooding with Shadowflame or Hellfire. Against decks like Grim Patron make sure that you save and be patient with the two heavy removals Hellfire and Shadowflame as they can be crucial in you winning the game. More on that in the Match-ups section of the guide. As the game is slowly going into the late game, and as you start facing bigger threats on the board, you want to be throwing out costly minions while still having something on the board left to deal with stuff he throws out. You really want to try to find space for throwing out Sylvanas Windrunner or Emperor Thaurissan, which might prove to be a challenge at some points. I have had a lot of games where I just didn’t have the space to play them but needed to play something else because my board was lacking. Against paladins see if you can save the Siphon Soul for Tirion Fordring, or big minions in other decks like Ysera or Malygos, those that are immune to BGH. The late game of this deck is covered by a pack of strong minions like Dr. Boom, Mal'Ganis, and Lord Jaraxxus, and of course the removal with the best animation of the game hands down, the Twisting Nether. Try not to solely rely on Mal'Ganis to survive as people usually save the BGH for him. Regarding Dark Peddler in late game, try to get some kind of a Power Overwhelming or a Soulfire, just make sure that you don’t have Doomguard and Soulfire in your hand at the same time, as they can’t really work together. Only cards with higher value than Rare and Adventure cards will be mentioned. Reno Jackson and Voidcaller can’t be replaced as the deck makes no sense without them. Even though you can always try to change a heavy minion for a heavy minion, these are the changes that won’t make the decklist suffer too much. The FULL SigGuide is done and is better than ever! I really hope you guys like it! This was the first time I took the time to make these pictures, so I hope you guys like them! Improving my decks and guides is my modest way of saying thank you for all the love from you guys! So if you liked the deck and want me to write out a more detailed guide with Matchups included, make sure you upvote, so that more people can see it! :) Cheers for checking out yet another Sigma's deck and as always, the constructive criticism and any suggestions to improve the deck are warmly accepted! See you on the stream! I'm not a fan of Warlock, but this deck really gave me lots of fun. Very comprehensive guide. Thank you. Wanted to use a deck with Jaraxxus and demons and this one is great. It has brought me from 16 to 10 in just an hour with win streaks! Thanks for the great guide and everything! If you dont have malganis, voidcaller isnt mandatory, right? Winning plenty of games with this deck cruising from 18->12 in a couple hours, most importantly winning the long tough matches that I would lose in the past against control decks. Actually, i would say that Sylvanas Windrunner and Mal'Ganis should be swapped on the "which legendary to craft first part" because Loatheb is a great replacement for Sylvanas Windrunner while there isn't really a good replacement for Mal'Ganis. what about the murloc paladin matchup? I've been seeing that more and more. What're your thoughts about this deck's future in Stadard? BTW, what do you think about subbing Piloted Shredder with Elise Starseeker? I use Ragnaros instead of Malganis. Maaaan this is a fun deck to play! Sometimes you get "really" awful draw and lose (may happen with any deck) but generally, you find an answer for aggro. 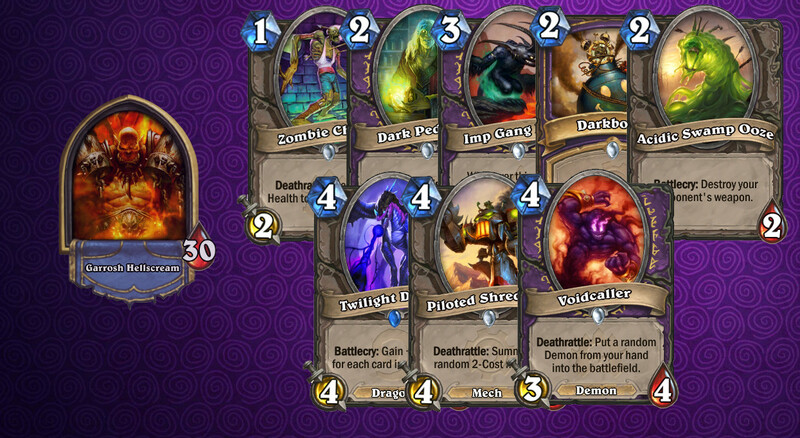 Demonwrath is like a mini-consecration, love it! Is MCT really necessary for this deck can I replace it with something else? it saved me some games, stealing important minions. You may use Earthen Ring Farseer. The effect is not the same but you can drop it on turn 3. It won't wait in your hand like MCT. Lost to tempo mage and even pirate rogue by turn 5, nice control bro, yet another great invention of trash deck from our almighty Sigma. Deck is ridiculously strong right now. Easy to climb with and fun to play because every game is very different and a lot of thinking involved from each play to the next. Druids and tempo mage still give you a hard time but 80% of the decks in the meta lose to them so that's no surprise. It fights almost every other deck very well. Getting stomped on by druids a lot around rank 14 and 15.
great deck, it works so great for me. i beat up nearly every other renolock or control warrior even with a bad starting hand. just now i beat a OTK-anyfin paladin. he got me down to 1 health, i was staying alive with siphon soul and he did not draw the second anyfin. maybe the giant? i have no giant and doing just fine without it. Played it on Legend today, still a very strong deck at the moment! Demonwrath is the best card against aggro decks. I saw people playing with Baron Geddon to beat paladins. But you really need this card. I'm playing since rank 10. 34-15 till now. Rank 3. But i haven't Sylvanas Windrunner so replace for Loatheb. Working pretty good. Great deck, i went from rank 9 to rank 5 last night and today. I took out doomguard for dread infernal as i thought doomguard would kind of be a dead card in hand unless it gets pulled out from a voidcaller.